Sea Wave: 4 – 6 ft. Swell Wave: 4 – 6 ft.
Several students have asked about seeing the stars in the Southern Hemisphere. Well I hate to disappoint, but I haven’t seen one star on this voyage. There’s a good reason though (and it’s not because I’m in the lounge watching movies). One of the main reasons this cruise is in the Eastern Pacific is because a layer of stratus clouds almost always covers it. While that’s not good for stargazing it’s great for the atmospheric meteorologists on board. One theory is that the clouds have a cooling effect on the ocean by reflecting the solar radiation back upwards and letting little of it penetrate to the surface. But it really isn’t completely understood at this time. Additionally the southeasterly winds in this in this area cause the surface water to move away from the coastline allowing deeper water to move up to the ocean surface, creating an upwelling current. Upwelling currents replenish the surface layers with nutrients which is why the fishing and marine life is so plentiful along the coast. The shifts in the temperature of masses of water, along with the effects of the clouds are what the scientists onboard are hoping to understand. What I have learned on this cruise is that the study of climate is very complex and that this area is particularly important. The Eastern Pacific may hold the key to a better understanding of the processes that affect the climate of the entire globe. The Chief Engineer Mike Gowan gave me a tour of the engine rooms today. He works down in the bottom of the ship and is responsible for overseeing all the major mechanics that keep the ship moving and habitable. There are 6 huge engines, air conditioning, water filtration, and sewage systems. It was really loud and we had to wear ear protection while we toured. He is assisted by Patrick,the Junior Engineer, and June, the “oiler”. (Isn’t it great to see women in the engineering room?!) Frankly I found it hard to conceive of working in that environment on a daily basis but they sure love it. 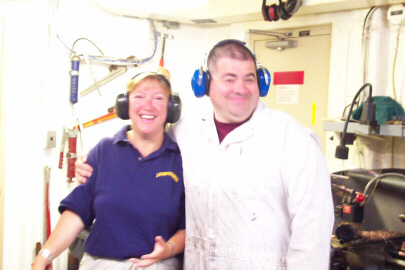 TAS Jane Temoshok and Chief Engineer Mike. This is Junior Engineer Patrick McManos. 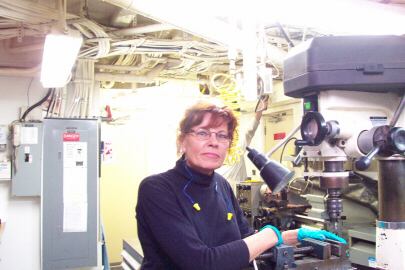 June, another crew member of the BROWN’s Engineering Department. 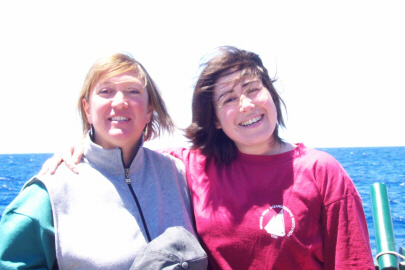 TAS Jane Temoshok (L) and her roommate, Claudia (R). 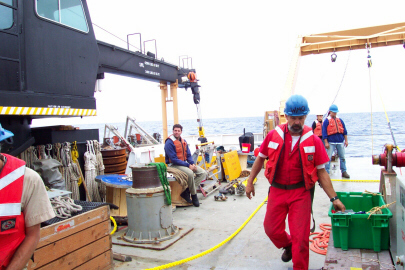 A view of the crew at work on deck. Question of the day: How long will it take the RON BROWN to travel from here to Arica (800 miles) averaging 13 knots/hour? 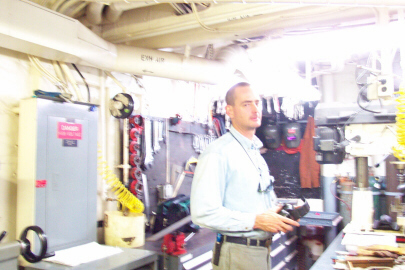 This entry was posted in 1990-2002, Jane Temoshok, NOAA Teacher at Sea and tagged atmosphere, atmospheric meteorologist, Eastern Pacific, engine room tour, EPIC, noaa ship ronald h brown, Stratus. Bookmark the permalink.